New Delhi, February 17: The deadly attack on CRPF (Central Reserve Police Force) convoy in Jammu and Kashmir's Pulwama district on February 14 has shocked the entire nation as well as the international community. From Kashmir to Kanyakumari, the entire country has lost it's 40 sons in the terror attack by Masood Azhar's Jaish-E-Mohammed. Following the attack, the intact Indians are trying to donate funds to the families of the martyrs. 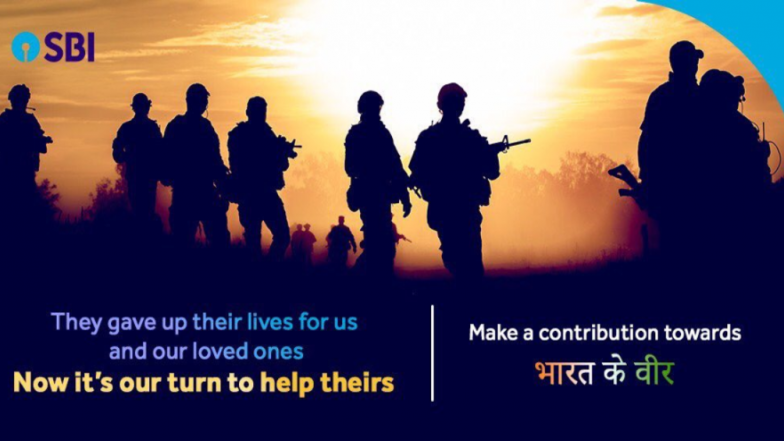 Several organisations have launched the facilities of payment gateways to contribute to soldiers family through Bharat Ke Veer, an initiative launched by the Home Ministry. State Bank of India, popularly known as SBI, has also enabled UPI (Unified Payment Interface) led payment gateway, through which people can donate to families of the victims. SBI in its official twitter handle said, "Would you like to provide assistance to the families of our martyred soldiers? Make a contribution at https://bharatkeveer.gov.in or through UPI using VPA (Virtual Payment Address): bharatkeveer@sbi." Pay Real Tribute by Donating Money For Bravehearts Via 'Bharat Ke Veer' App or Online at bharatkeveer.gov.in. Earlier, on Saturday, the Indian e-commerce payment system, Paytm had created a separate window for contributing to the soldiers. The "CRPF Wives Association" has collaborated with the digital wallet for donations to martyr families. If a person wants to donate through Paytm, the user will be required to fill the name and PAN number and the amount they wish to donate. The user can also download the receipt from "My Orders" section. Akshay Kumar Urges People to Donate for CRPF Martyrs of Pulwama Attack via bharatkeveer.gov.in Official Website; Warns of Fake Sites and Apps. The state governments have also announced ex-gratia for the martyrs family and even government jobs to their wives and children. Several famous personalities like businessman Mukesh Ambani, Bollywood actor Amitabh Bachchan, Punjabi singer Diljit Dosanjh, cricketer Virendra Sehwag, have extended their helping hand to support the families of CRPF victims.